“I am not a violent person,” you respond? Why are there so many calls to 911 for domestic violence? Korea, “Will there ever be a whole nation? Will you be forever broken in half? Iran, “Is there any sheath that will hold the sword of nuclear war? O Nations, do you have Departments of Peace? We know you have Departments of War? All creation groans for the peace, not for power, greed, prestige or possessions. All creation groans for the peace the world cannot give. Listen to Jesus’ last plea from parched lips as he hung on the cross for our salvation. War No More, Swords Into Plowshares, mottos of the New World. Unity, justice, peace reign in a compassionate world. O my people, return to the Garden of Eden. What are ways that families can foster non-violence in their homes? In what ways can schools teach the art of non-violence? What helps are there in your area that teach anger management? When will gun laws be revised and enforced? How can you personally become an advocate for peace, unity and justice? begins with me. Let’s pray for each other to be PEACEMAKERS. thank you! i love your poems! they always inspire me to be a better mom. one way we teach non-violence is in how we apologize. first, we say we’re sorry, then we say what we did wrong, WHY it was wrong and then we finally say what we will do the next time. that small change has made a large difference in the normal sibling scuffles! Your cry for peace and non-violence is heartfelt and true! I pray that people of the nations mentioned long for it, work for it and pray for it too. Sister Juliemarie McDonald joined the Sisters of Notre Dame of Chardon, Ohio in 1951. 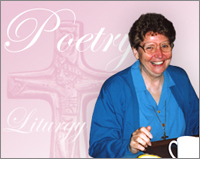 She holds an MA in English Studies from John Carroll University MA in Scripture from St. Charles Seminary. After 32 years of teaching classes ranging from first grade to college level, she then became a researcher, campus minister, director of religious education and a pastoral minister in Mease Hospital in Dunedin, Florida. In her semi-retirement, Sister Juliemarie writes reflections and faith sharing sessions for the young sisters in formation in Africa, Philippines, Korea, India and the USA. Her spare time is spent as a crafter.